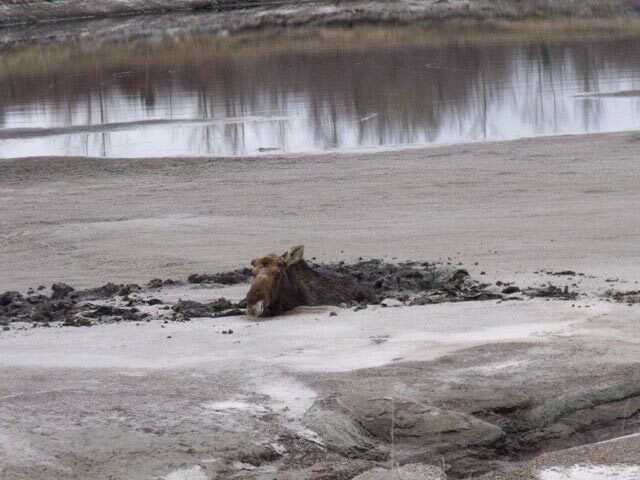 This cow moose was hopelessly stuck in the mud. She would die without help! Sunday April 15, 2012 dawned cloudy and cool in the little community of Terrace Bay, located along the north shore of Lake Superior. My friend and fellow Conservation Officer Jeff Anderson stopped by the house, my wife Eleanor made fresh coffee and we were enjoying a day off now that the fishing season for walleye had finally closed. 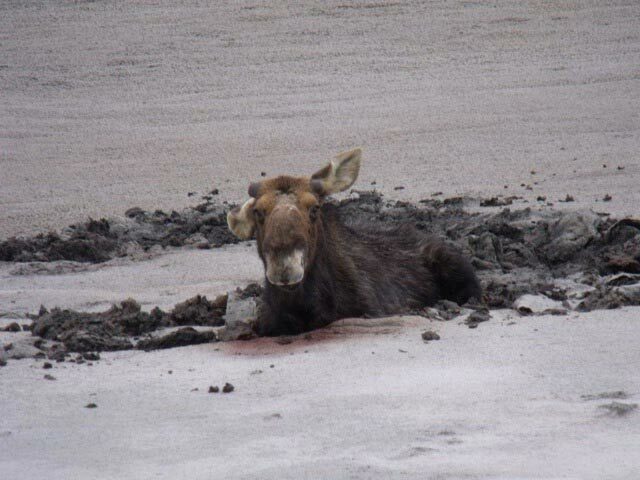 When the phone rang that morning, it was to alert us that a moose was helplessly mired in a spillway next to the town's pulp mill. Normally, the hustle and bustle of a busy factory would discourage wildlife from getting too close, but in this case, the mill had been idle for quite some time and the mill yard was quiet and tranquil. 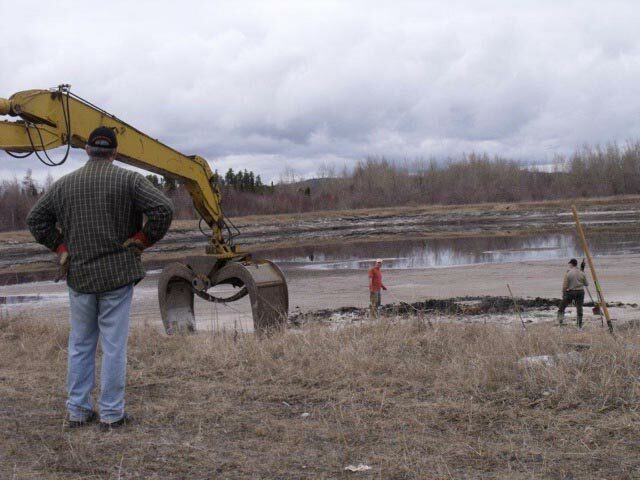 The large man-made ponds that surround the property are part of a system used to treat waste water. They are all fenced except for the one closest to the buildings. It's unclear as to how the young adult bull wandered into the first one maybe he was fleeing a vehicle on the nearby road, or perhaps he just thought it was a marsh. 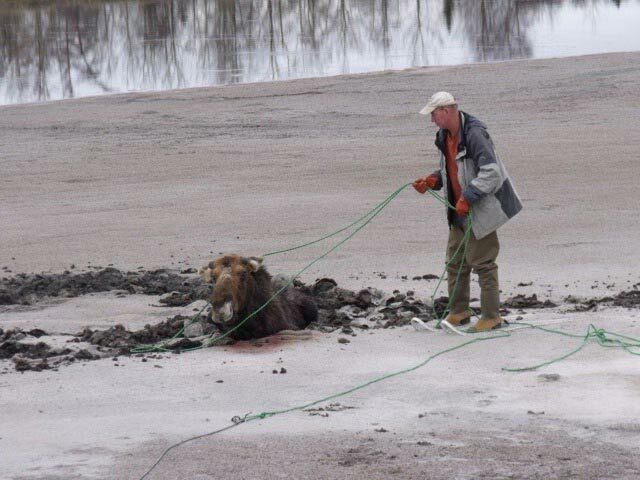 Whatever the reason; he attempted to cross the football-field sized settling pond and began breaking through the deep layers of sodden wood fiber. We quickly hatched a plan and began gathering some rope, hip waders and snowshoes while Jeff grabbed a patrol truck, uniform and shotgun. It was important to be prepared for any eventuality! 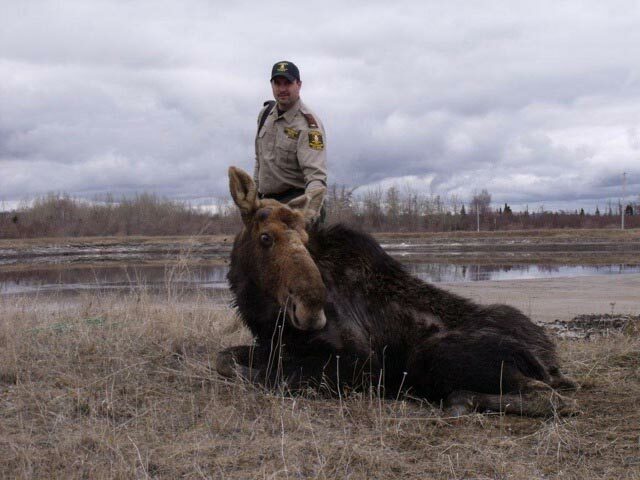 The moose is watching his rescuers. When we all rendezvoused at the site, we were faced with the saddest looking animal you could imagine. 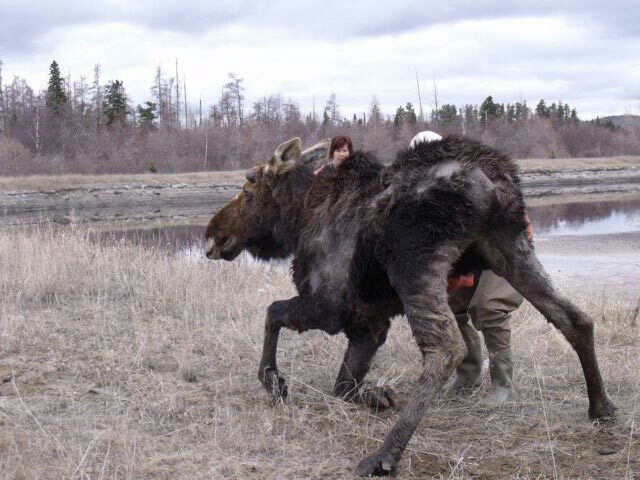 Utilizing the snowshoes to stay on top of the layers of fibre, we were able to approach the bull, fasten a chain knot around his neck and attempt to pull him free utilizing the winch on patrol truck. Unfortunately, we could not pull him horizontally with sufficient force to drag him out without the risk of injuring him, so we needed a new approach. 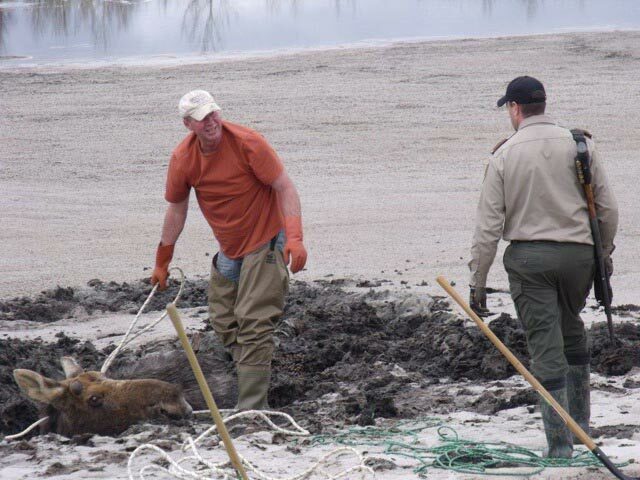 The first step in the rescue was to attach a rope. 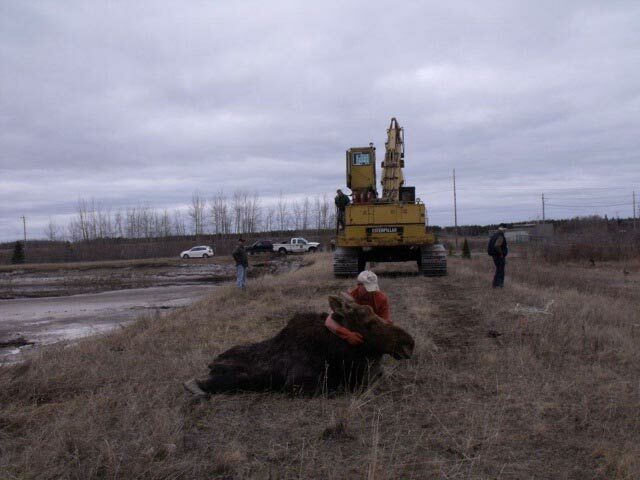 The rescuers dig around the moose chest. Mill staff came to the rescue and arrived on scene with a large, tracked loader equipped with a boom grapple. 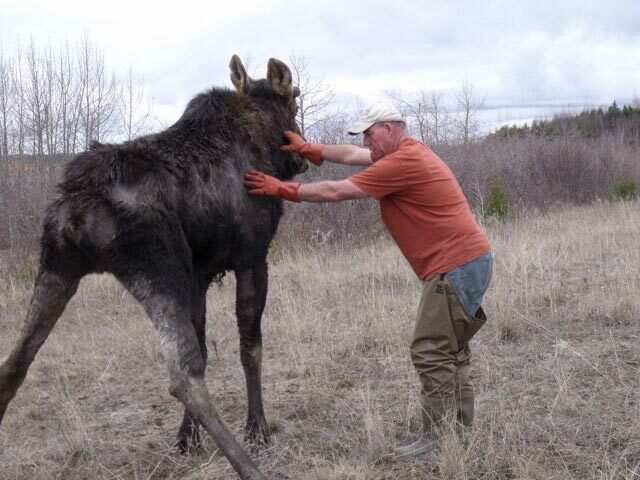 The rest of us shoveled a space around the moose's chest around which we were able to secure a heavy line. 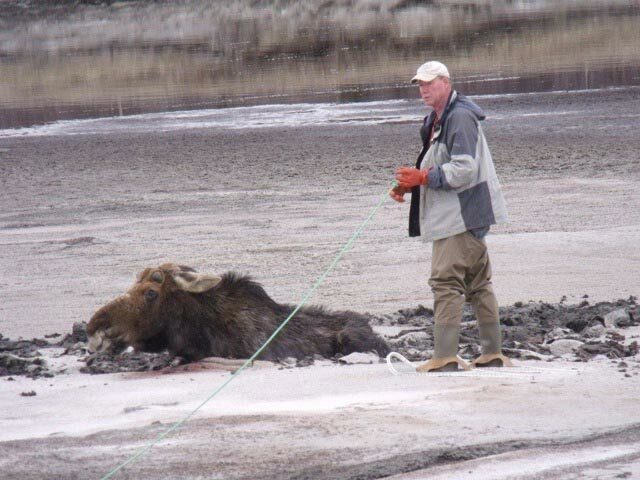 With this new ability to lift and pull from around the animal's girth, the big bull was slowly drawn out of the muck and onto the bank. It appeared as though he had been there overnight and he was near death from exhaustion and stress. Remarkably, by supporting him in a prone position, giving him a couple bottles of water to drink and rubbing his legs to restore circulation, he began to perk up! 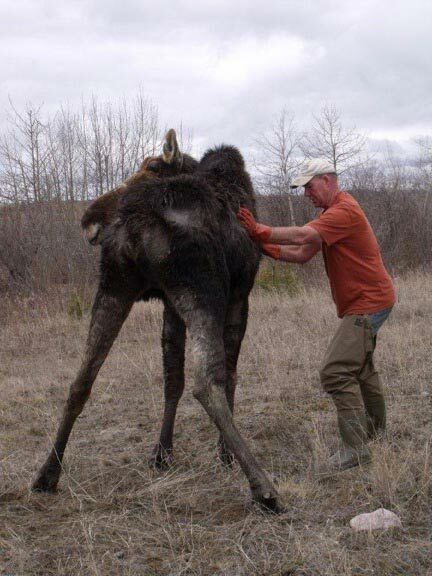 The moose has been extracted, will he survive? After 20 minutes and several attempts, he stood up on wobbly legs for the first time in many hours. He tolerated us as we held him up and later, as he began walking with our assistance. It was a very strange experience to calmly accompany him for the long walk around the pond's perimeter, but we all felt the same heart-warming feeling when he quietly stepped into the bush under his own power, and disappeared from sight. Special thanks to Paul Dennis for allowing us to publish this story. 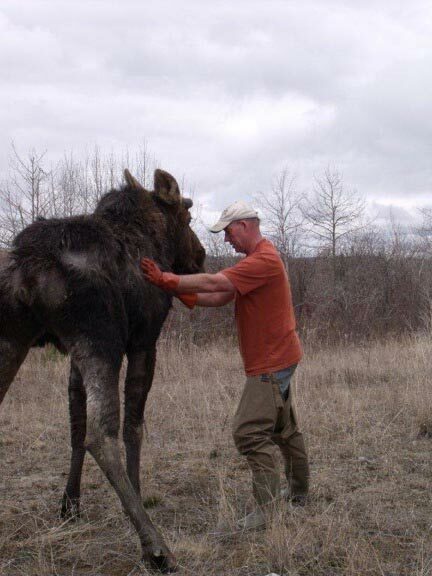 Thanks also to Jeff Anderson and all others who were involved in this moose rescue.